Serrated polyps of the colon: how reproducible is their classification? For several years, the lack of consensus on definition, nomenclature, natural history, and biology of serrated polyps (SPs) of the colon has created considerable confusion among pathologists. According to the latest WHO classification, the family of SPs comprises hyperplastic polyps (HPs), sessile serrated adenomas/polyps (SSA/Ps), and traditional serrated adenomas (TSAs). The term SSA/P with dysplasia has replaced the category of mixed hyperplastic/adenomatous polyps (MPs). The present study aimed to evaluate the reproducibility of the diagnosis of SPs based on currently available diagnostic criteria and interactive consensus development. 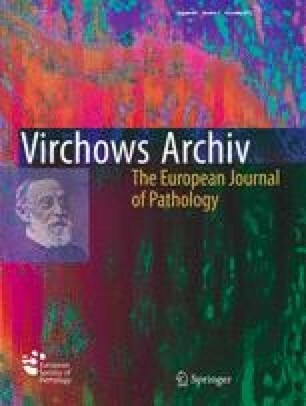 In an initial round, H&E slides of 70 cases of SPs were circulated among participating pathologists across Europe. This round was followed by a consensus discussion on diagnostic criteria. A second round was performed on the same 70 cases using the revised criteria and definitions according to the recent WHO classification. Data were evaluated for inter-observer agreement using Kappa statistics. In the initial round, for the total of 70 cases, a fair overall kappa value of 0.318 was reached, while in the second round overall kappa value improved to moderate (kappa = 0.557; p < 0.001). Overall kappa values for each diagnostic category also significantly improved in the final round, reaching 0.977 for HP, 0.912 for SSA/P, and 0.845 for TSA (p < 0.001). The diagnostic reproducibility of SPs improves when strictly defined, standardized diagnostic criteria adopted by consensus are applied.